Last year I promised that I would remind you about Purim, the Jewish holiday that commemorates the story of Esther, so that you could hold your own Purim festivities. The date for Purim changes every year because it is based on the Jewish calender and this year the date for Purim is March 7th and 8th-- sundown on Thursday to sundown on Friday. We had so much fun celebrating it last year and I am planning on doing the same things we did last year-- making groggers, eating hamantashen, reading and re-enacting the Esther story -- but this year I am going to try to incorporate some of the other (more religious) aspects into my celebration. Fasting, to remember Esther's fast, is one thing that I'd like to try this year. Even though it is hard for me to fast when I am breastfeeding I am going to do my best. I'll probably fast something else besides food, like the Internet or looking in the mirror. The other Purim tradition I am excited about doing this year is the tradition of giving food to your neighbors and to the poor. I think I'll try to get Asher and Rose to dress up like characters from Esther's story and go around passing out goodies... unless it is snowing. And since that is a real possibility it might be that we end up taking few bags of food over to the food bank and then eat all the treats ourselves. Either way, it is just fun to celebrate a holiday totally dedicated to a woman from the scriptures. Thank you to everyone who voted on The Great UpCycled Dress Challenge, we had over a hundred people vote! It looks like I owe Brittney dinner. Her dress won "the most improved" with 68% of the vote and "the most wearable dress" with 72% of the vote. I got creamed. Yet in my defense I did win " The ugliest dress to begin with" with 79% of the vote. There is only so much you can do with blue pleated polyester. 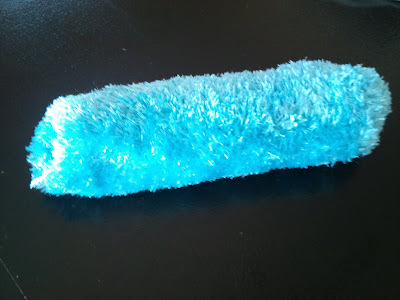 No, it isn't a dismembered arm from Cookie Monster or a Tribble (for all you old school Star Trek fans), it is a microwave corn bag with a washable cover. I have always loved using hot corn bags for sore muscles (and they are awesome during labor) but I hate it that after lots of use the outside material gets really gross and you can't wash it because well... it is filled with corn. These corn bags have two layers and so you can take the first layer off and wash it if it gets grimy. These are super easy to make and so I am going to do a sad attempt at giving you a tutorial on how to do it. 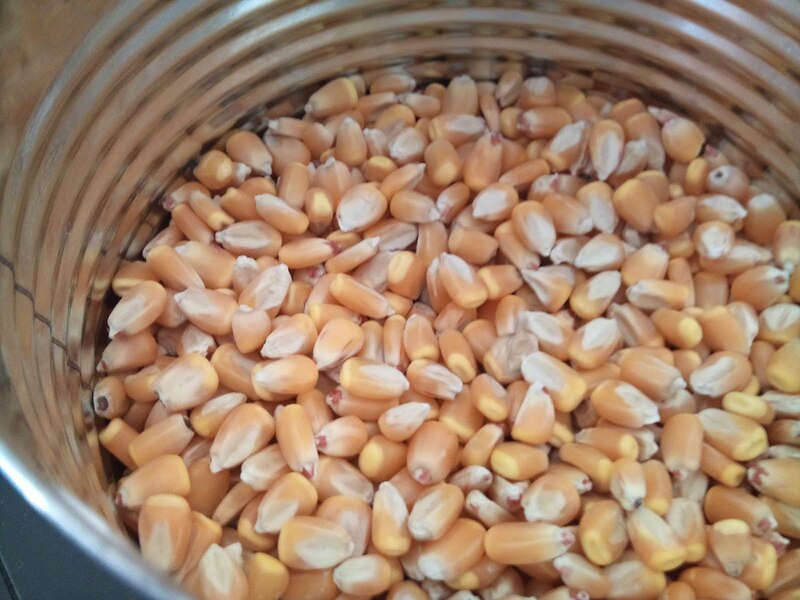 Fill the athletic sock with 2 cups of this type (pictured below) of large dried corn. I think our Relief Society president bought a 50lb bag of it from a feed store. Don't use popcorn. That would be disastrous in the microwave! You could also use rice if you wanted, but rice sweats and (I think) stinks when it is microwaved so I prefer to use corn. 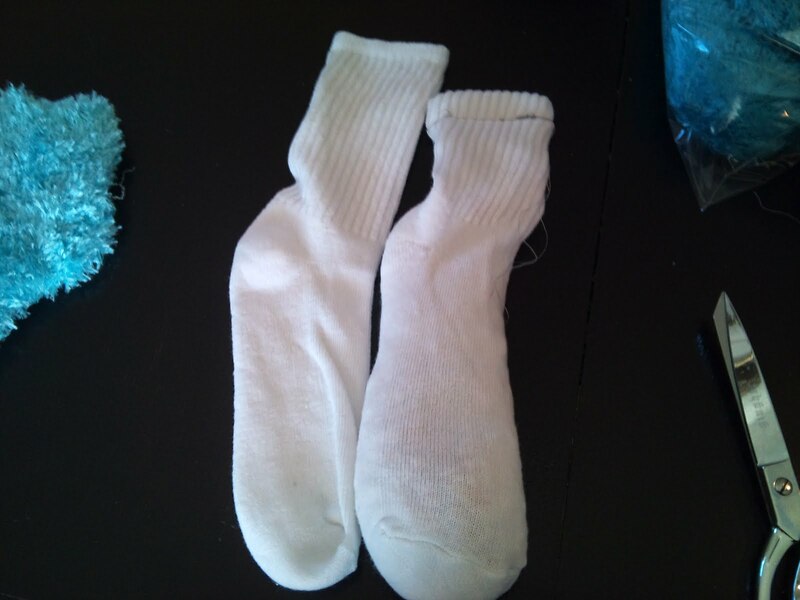 After filling the athletic sock fold the top down and tuck it inside of itself and then sew it shut, using a small stitch size so that nothing falls out between the stitches. 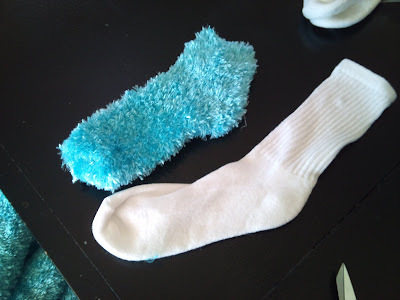 Put the athletic sock inside the blue sock, stick it in the microwave for a minute or two, and then place it on your sore neck. Ta da! So easy. Oh, and I have one more thing to say about the corn bags. We got rid of our microwave about a year ago and the only thing that I have missed about not having one is being able to use my corn bags. I was really sad about this until I found out that you can heat them up in the oven. Just place it on a cookie sheet and then put it in the oven for 20 minutes at 250 degrees. I was so excited to learn this and I thought I'd just pass it along in case there are other microwave-less people out there mourning the loss of their corn bags. 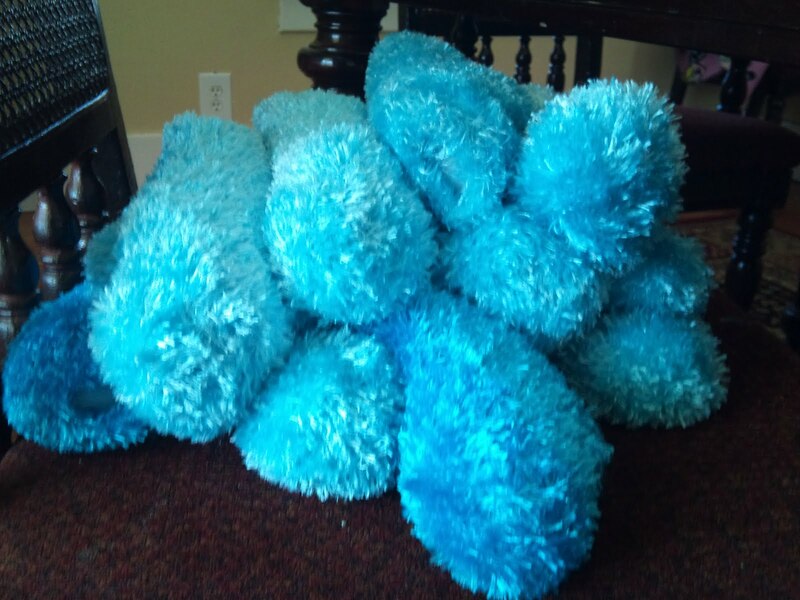 Did you know that today it is Dr. Seuss' 108th birthday! Last week I listed some of my favorite books and I realized that my list just wouldn't be complete with adding to it "Yertle the Turtle", "Horton Hears a Who", and "The Sneetches" by Dr. Seuss. It never fails to amaze me how brilliantly Dr. Seuss was able to address some of the most complex social issues in such a fun and imaginative way. What a great man. My kids and are going to pull out every Seuss book we own and spend the afternoon having a "Seuss-reading- ma- blanket a-thon"! I sure hope that you have a zizzer-zazzer-zuzz , gluppity-glupp, rink-rinker-fink, fizza-ma-wizza-ma-dill weekend! I have a rice bag. When my wrists got so tired from being on the computer for too long and instead of having to go buy a gell computer wrist rest, I got out my rice bag and set it below the keyboard and it works great instead and fits right along. I was in Israel in 1996 for Purim. Saw some teenage boys being not so nice with a donkey and told them to knock it off. thanks for passing that on about heating rice bags in the oven. i am considering switching my microwave out for a toaster oven, but the thing i was saddest about was my rice bag, which i use every single night in the winter to warm up my bed. but i was going to say that hot water bags are also wonderful and actually hold their warmth a lot longer. they just don't do the cool drapey thing that rice/corn bags do. anyways, thanks! I'll have to try corn instead of rice. I've never minded rice, but maybe corn is better. Thanks for sharing! Why did you get rid of your microwave? I got rid of my microwave four years ago and still get made fun of. You are the only person that I sort of know who has done it too, and you have little kids. BRAVO! Thanks for the rice bag in the oven tip. Really enjoy your blog. I don't know that I have a really good answer for why we got rid of our microwave. I've known for a long time that you shouldn't put any sort of plastic item in a microwave because it create some really toxic chemicals. But about a year and half ago my husband had to take a toxicology class for his degree and in the class the talked about all the things in your home and environment that are toxins and cause diseases and other problems. There are quite a few REALLY AWFUL toxins that come out of plastics, and they are REALLY REALLY BAD when you put them in the microwave. Well it really started to stress me out, because most things I used the microwave for where in plastic containers. I stopped using the microwave for my plastic things and I realized that I actually didn't really need it that much. It took up a lot of my counter space and so I decided that I just didn't want it any more. And like I said in my post I honestly have not missed it at all-- except for corn bags and now that I know you can put them in the oven I don't miss it at all. That's interesting. I've never found ANY research that actually proved toxins come out of microwave safe plastic in the microwave. I've only seen the hoax stuff that you can find on snopes.com, etc. My husband has a PhD in chemical engineering and he's never heard of anything either. I'd be interested to know what studies or information your husband was taught. I have a "hot pack" filled with cherry pits that I bought at a drug store in Germany. It is fantastic and smells great too. My mission companion cooked hers in the microwave for too long and it took on that burnt popcorn smell so wetried washing it in the washing machine and it worked like a charm. I'd love to find some cleaned pits and make more!